In honor of Bike to Work Week and the Blessing of the Bicycles, I offer you my counsel on how to encourage others to use bikes for everyday transportation. This is for bike folks who are religious in their devotion to bicycles. 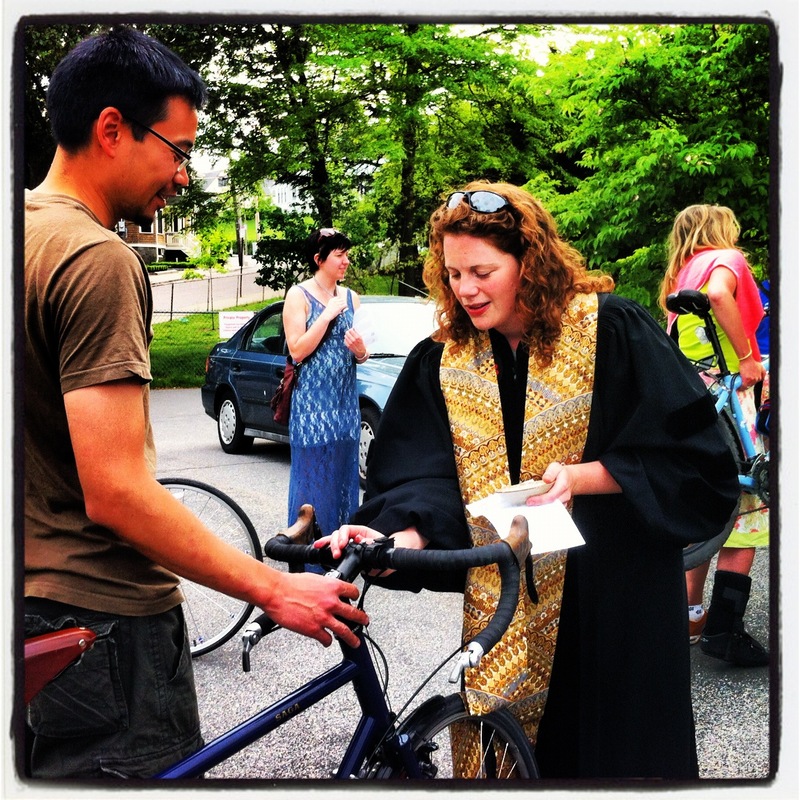 As a pastor and a commuting convert, I can attest to the life changing power of bike evangelism ™. I saw the ease and joy of friends as they swapped their cars and subway passes for bikes. These friends pointed me to the good life on a bike. They showed me how to schlep groceries and properly lock to a lamppost. They made giving up my car seem manageable. We need more people pointing the way towards bikes as everyday transportation. You too can be a bike evangelist. And remember, we’re out to win hearts and minds, people. I know it’s a heavy cross to represent all cyclists everywhere, but you have the ability to change the mind of that person who is convinced anyone on a bike is a jerk. Remember, hearts and minds. 1. Wear your helmet: “He put on righteousness like a breastplate, and a helmet of salvation on his head” Isaiah 59:17 Seriously, put on your helmet. I know it’s hot and sometimes uncomfortable, but put it on. I have giant hair; you are complaining to the wrong person. Your helmet signals that you care about your own life. That’s a good place to start in convincing motorists to care about you. 3. Obey the Law: All who will not obey the law of your God and the law of the king, let judgement be strictly executed on them, whether for death or for banishment or for confiscation of their goods or for imprisonment.” ~Ezra 7:26 Yes, it is a pain to stop at every red light. Yes, you need to do it. If you actually want more cyclists on the road and safer roadways, you need to obey the law. Tough love, friends. Every time a motorist sees a cyclist disregard the law, we just give them fodder for gross generalizations that we’re all punkly jerks who deserve to be chastened when they drive too close. Know the laws and know your rights. When you don’t obey the laws, it’s confusing to motorists, pedestrians and other cyclists. Cops in Boston and surrounding towns are ticketing. Lastly, blowing a light doesn’t save you that much time. I know this because I often catch up to you guys by the next light. Instead of disregarding the law, get stronger legs. 4. Smile: “I smiled on them when they had no confidence; and the light of my countenance they did not extinguish.” ~ Job 29:24 Cyclist have a bit of a reputation for being a Surly bunch. This does not help our cause. Smile at pedestrians. Smile at the driver in the car pulled up along side of you. Most of all, smile at other cyclists. And then talk to them. Build community and revel in the joy of being on a bike. Remember, you want more people on bikes; it’s safer for us all. Caught in a giant, miserable rainstorm, another cyclists smiled and we started chatting. Because I responded in kind, I got to ride home with none other than then City of Boston Bike Czar and Olympian Nicole Freedman. 5. Love your Enemy “But I say to you, Love your enemies and pray for those who persecute you,” ~Matthew 5:44 This is always the hardest commandment. At some level, it means getting inside the head of the angry motorist and sympathizing with their experience of feeling anxious and entrapped by traffic. You would be stewing too if you were sitting in a car rather than out on your bike. Be clear and firm in taking the lane and maintaining your space on the road. But don’t return their evil for evil. Don’t presume malice. State your case clearly “when you drive that close to me I feel unsafe.” or “Excuse me, I don’t think you saw me. Please look before you open your door.” In my experience, motorists are often defensive when you confront them on bad behavior. Turn on the charm offensive. Practice Commandment 4: Smile. 6. Be a bike sherpa/shepherd “Who shall go out before them and come in before them, who shall lead them out and bring them in, so that the congregation of the Lord may not be like sheep without a shepherd.” ~Numbers 27:17 As a established cyclist, you are obliged to raise up the next generation. You can lead these new lambs safely in the paths of righteousness, rather than wandering off on their own through the dangerous streets. This is especially important for women, who are under-represented as bike commuters (and why we need to be advocates for physically separated paths and cycle-tracks). We need more female bike shepherds. When I was thinking about commuting to work, a experienced cyclist suggested that we try out the route on a Saturday. I followed her and saw the possibility. Reach out. Ask if someone (especially the wandering, Hubway-riding tourists) needs help. Show them the way. Certainly, this is incomplete. Wearing your helmet, obeying the law, and smiling may not prevent an angry motorist from putting cyclists in danger. But it may help diffuse a tense situation and show bike skeptics the possibility for a joyful life on a bike. How are you a bike evangelist? What other commandments would you add? Why doesn’t Church ask us to Check In?